Summary: Brook Gunderson is a teenage boy with two great loves: baseball and pranks. But when the pranks get him into trouble with his new baseball coach, Brook finds himself benched for upcoming games. Struggling to get back in his coach’s good graces, Brook learns to take a hit from the ball when he’s up at bat. But his pitching career seems to be cut short when a day of fun and another stunt injures him in a way that means he will never regain his fastball. Faced with a choice to let this new turn take him down or to get creative, Brook comes across an article about a pitch called the knuckleball and decides he’s not ready to give up just yet. Review: Today I learned that teenage boys are pretty dense. Over and over Brook is involved in stunts that get him into trouble and endanger his life and dreams. Yet it doesn’t seem to sink in. He doesn’t learn that these pranks and stunts are things that maybe he shouldn’t be doing, no matter what consequences follow them. Except it was funny. Even though I was yelling at Brook to stop putting his pitching career in jeopardy, I was also laughing at his antics with Jiggle, his best friend. Yes, they went a bit too far at times, but it was amusing. Chin Music by Gregory Roberts isn’t all fun and games though. At its’ heart, it’s about a family with two very different sons. One takes his disappointment in life and turns it into a drug addiction and an excuse to become a drug dealer. And the other puts himself in a position where his dreams are at stake, but he finds a way to turn things around. It’s not clear why one is able to rise above while the other one isn’t, but it’s an interesting comparison. Again I was drawn to the younger sibling in Brook’s sister Taylor. She’s ten years old and thinks the world of her older brother, even though their relationship mostly consists of her being used to cover for him. Taylor doesn’t get enough credit in my book, and I hope that Brook reconnecting with his brother also means he will stop taking Taylor for granted as well. 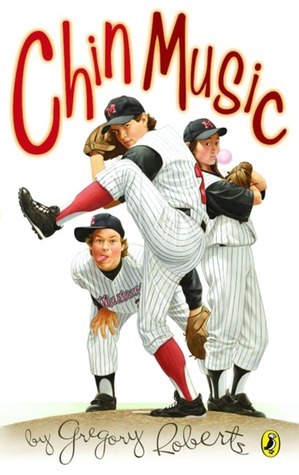 Overall, it was a lighter read that will be enjoyed by early teen readers with an interest in baseball. Brook’s pitching career and Roberts’ use of baseball terms were interesting and quite informative. 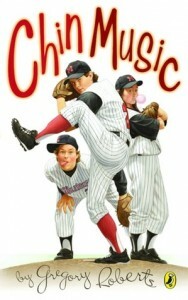 Chin Music by Gregory Roberts is published by Puffin Canada, (2007).